Quilters truly are some of the most generous people. On Wednesday, I joined around thirty other women to learn how to make the Emma’s Legacy quilt that I blogged about earlier this month. It wasn’t so hard, after all. Not with so many dear ones rushing to my rescue. The correct method to square-up my half-triangle squares, using my lethally-sharp Gingher rotary cutter. Without slicing off a finger. How to make perfect star-points. Well, almost perfect. About the wonders of glow-tape, heretofore unknown in my world. How to make an exact ¼ inch seam though my 1945 Singer Featherweight sewing machine was missing the proper presser foot. Whew. The ladies’ expertise was freely shared, as well as laughter and friendship, encouragement, and a generosity of spirit that made me wish my weeks were bursting with workshops. Even lunch was a practice in generosity. Each woman at my table brought enough for five or six others, joyfully passing around the avocado, melon, tuna, Tillamook cheese, and yummy Girl Scout cookies special ordered from Iowa. Yum! I hadn’t realized the recommendation to “Please bring a bag lunch” meant a grocery bag to share with everyone. But now I know. I’m already plotting treats to lug along next time. Within this circle are some who meet on Mondays for Community Service, making comfort quilts to cover special folks with that cozy, quilted love. Last year alone, the women made and donated over 400 small and lap quilts to various organizations, including Head Start, Meals on Wheels, Children & Adult Protective Services, Alternatives to Violence, convalescent hospitals, and rest homes. That shared quilter heart is everywhere. In our small community and far beyond, quilters rush to rescue those in Japan who have little or nothing left, sending soft, baby and lap quilts. A national movement called “Quilts for Japan” is already coordinating a gargantuan effort to reach out to the Japanese people affected by the earthquake and tsunami. A true tidal wave of loving care. I think I’ll dive in. Interested? To learn more about the “Quilts for Japan” project, go to A Quilter’s Newsletter. Then, get quilting! 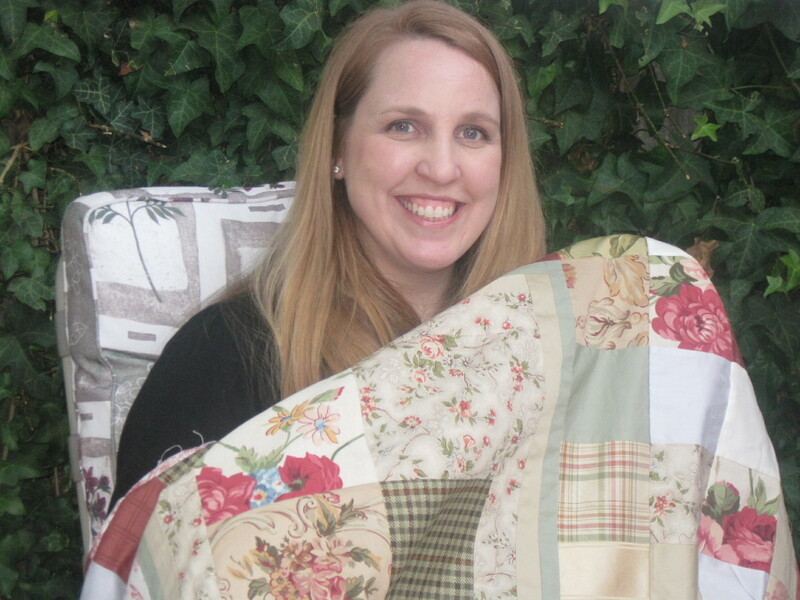 Recently, I signed up for a workshop to learn to make a little quilt called, “Emma’s Legacy.” It’s just the kind of pattern I like best – very old-fashioned and scrappy. Reminiscent of the collection of quilts in grandma’s linen cupboard, tenderly pieced with parts of grandpa’s best shirt or baby’s christening dress. In those days, folks used what fabric they had, giving it new life in the form of a functional coverlet. A treasure cherished by generations that followed. As Jane Austen would say, “I was all anticipation” until I heard that this pattern was so very complicated. The pieces are small and there are a lot of them to sew together in an intricate way. And then, there are the points! Oh, my. All those points must match perfectly. One gal told me that after attempting the “Emma’s Legacy” quilt, she had renamed it “Emma’s Lunacy.” She failed to finish it. After hearing her take, I thought about backing out of the workshop. Seriously. Did I want to set myself up for failure? Okay, maybe that last cliche doesn’t apply here. But you get my drift. So I decided not only to take the class, but to complete the quilt on my newly acquired 1945 Singer Featherweight. A tiny sewing machine for a tiny quilt. I feel a little victorious before it’s time, facing the lunacy project with renewed passion. But I am confident that with a little American ingenuity, I can see it through to the end. Now, to focus that same spirit toward a certain writing project I’ve been tickling around the edges. It’s time to plunge forward into the fray, ready for battle, expecting victory. When my daughter, Heidi, was little more than a toddler, I planned to make her a Raggedy Ann for Christmas. Time has blurred the reason why I didn’t get it finished, but I do remember handing her a box of red and blue fabric and bright orange yarn, along with a hug and an IOU. So when a big birthday loomed ahead, I determined to do something special for her. To make a luxurious quilt that would surround her with “mommy-love.” And absolutely not give her an IOU on that most important day! Because she loved Ralph Lauren bedding, I searched for just the right sheet to serve as the basis for her quilt. And I found the perfect pattern called “Cole Brook.” Unfortunately, it was a king-sized bed skirt instead of a full sheet. But, it had the right colors, the right weight, and feel. A soft, cotton sateen. It would do very well. In truth, I collected fabric for more than a year. Finding only Ralph Lauren fabric proved to be too daunting for me. Eventually, I added other brands of high thread count pillowcases and luxurious fabric samples. The big day drew close and still, I shopped for just one more piece for an elusive quilt square. Maybe a silk plaid or a linen toile would give it that elegant edge I wanted. Heidi & her "Mostly Ralph Lauren" quilt. With only two weeks to go, I started rotary cutting and stitching, piecing the quilt. I worked into the wee hours, knowing I didn’t want another Raggedy Ann moment on my parenting record. Just in time, I got the quilt top finished and wrapped for the big party. In a perfect world, the entire quilt would be completed, but I was happy to hand Heidi an original Medallion-patterned coverlet – almost a quilt. And lots of mommy-love instead of an IOU! I called it “Mostly Ralph Lauren” and she loved it. Mission accomplished. Now, there is still the problem/promise of that Raggedy Ann….